THROUGH FIRE have released the video directed by Steven Contreras for their current single "Where You Lie" off of their latest album Breathe today, and you can check it out now on KNAC.COM right HERE. 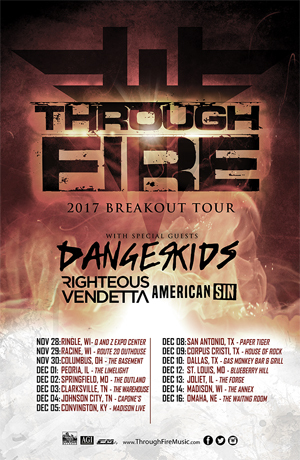 After touring coast to coast as support for bands such as SEETHER, BLACK STONE CHERRY and ALL THAT REMAINS, THROUGH FIRE announces their first headline run, the 2017 BREAKOUT TOUR!! They'll be hitting the road with DANGERKIDS, RIGHTEOUS VENDETTA and Sumerian Records label mates AMERICAN SIN. It's been an amazing year with their single "Breathe" going top 10 in the Country at rock radio, #1 on Billboards Mainstream Rock recurrent chart and their second consecutive single to hit #1 on Octane. Their current single, "Where You Lie", was the most added song in the Country at its debut, and they recently signed with one of the worlds leading booking agencies, Artist Group International.